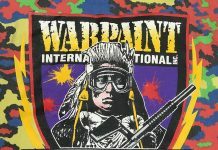 A variety of paintball jerseys and the stories that go along with them. 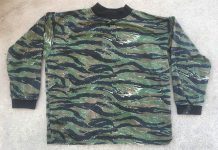 This Renegade Tiger Stripe pullover lacks the signature front tags and embroidered elastics that Renegade products usually featured on the collar and cuffs. A radical Rengade Glow Oak Pullover that has been silkscreened for Dan Bonebrake's company, Warpaint International based out of Oregon which host Supergame.